The Biggest Fish Ever since 1986? On September 15th. last, Tony Murtagh from Co. Dublin landed & released a fish estimated at approx. 25lb. weight. This huge fish was taken on spinner on the Island Stream on Beat 6 - Lower Kilmurry. The fish was rather coloured but fin perfect and very well conditioned – being very deep bodied & broad-backed. It was quickly released without even a picture being taken as they had no camera & no weigh net! It measured 96cm (38") long with an estimated girth of 50cm (20"). A 13.5 pounder measured 81cm, a 15 pounder was 85cm & a 19.1 pounder measured 89cm. around the wrist of the tail, which was definitely much thicker than the 19 pounder. on prawn at Gorman’s Pool on Kents – Beat No. 4. It weighed 19.1lb & was absolutely tide-fresh. which they reckoned were the same size as the one he caught – it was the only take of the day! On September 8th., Belgian anglers Guillaume Verlings (l) & Jean-Paul Hendricks ® both caught their First Ever Salmon! They were both taken on spinner on the Castle Flat on Beat 3 - Ballinaroone & weighed 16.6 & 9.8lb. Both fish were sea-liced! 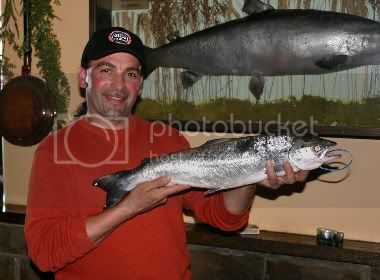 Guillaumes' was the Heaviest First Salmon of 2009! In 2009, there was much talk about drastically reduced numbers of salmon running into many rivers. Here on the Blackwater, whilst the spring run wasn’t so good, from May on we saw good numbers of fish running. since I started accurate records in 1986. It was only beaten by 1994 (82) & 1996 (72). there were a couple of factors which help explain the lower catch figures for the backend & consequently the total season catch. which is a major factor which is often not taken into consideration when looking at catch statistics. The other startling factor in 2009 was the behaviour of the fish themselves. they displayed a startling reluctance to take any offering. This was a phenomenon which was observed throughout Ireland this last season. The table below shows the catches since I took over the Lodge in 1986. Blackwater Lodge Fishery - Salmon Catch Statistics. As an aside – 43% of the fish caught in 2009 on the Lodge Fishery were released. for 2008. Our guests released 52% in 2008. – the highest in the country for rivers which were not designated as C&R only. rather than mere number of fish caught, which of course depends on fishing effort. which corresponds to the period since the drift nets were banned. which wouldn’t be apparent from the catch statistics for the number of fish caught by month alone. In August, there are actually far less people fishing on the Lodge beats compared to September. Graph 2: Dramatic increase in larger fish. The Blackwater has always been better known for its prolific runs rather than the size of the fish. but accurate analysis of the weight of fish caught doesn’t actually bear this out. This graph illustrates the percentage (of the total catch each year) of fish caught by weight class. Please note that for this purpose - for example - 8lb. represents fish between 8-8.9lb, 9lb represents fish of 9-9.9lb etc. For simplicity, I have only included the figures for fish in the 8-14lb class which is where the biggest difference can be seen. Fish in this class accounted for 33% of the 2009 catch compared to only about 18% for the period 2004-2008. - The average percentage for the years 2004-2006 i.e. the last 3 years when drift nets operated. - The average percentage for the years 2007-2008 i.e. the first 2 years without drift nets. - the figures for the 2009 season. for the 3 years before & the 2 years after the drift net ban. There is however a dramatic difference in 2009. The true difference is perhaps not adequately illustrated in the above Graph 2.
in each weight class by pound compared to the average figure for the period 2004-2008. It will be very interesting to see what will happen next season. In the early ‘90s we carried out our own scale-reading study of fish caught on the Lodge fishery. Grilse: We concluded that grilse were almost exclusively 1/1 i.e. spent one year in the river & 1 winter at sea. Therefore we can expect to see the return of a lot more grilse in 2010 – the progeny of the 2007 run – the first season without drift nets. if the increase in 8-14lb. class fish will be sustained next year. Prospects for a great season’s sport for anglers for whom size really does matter! Proprietor of Blackwater Lodge - Ireland's premier salmon fishing lodge - with his wife Glenda. The Lodge is situated 35 miles from Cork in a beautiful location overlooking the Blackwater river. 15 miles of private fishing. B&B/cottage accommodation, smokery, guides. Fly-casting & Fishing Tuition with Glenda (APGAI-IRL Salmon & Trout) – Europe’s highest qualified female fly-casting instructor & Emerald World Masters Ladies Salmon Distance Casting Champion. The First Springer is Caught on the Blackwater Lodge beats. this weekend & scooped the First Salmon of the 2010 season to be caught on the Lodge Fishery. He was fishing on March 6th. with gillie Connie Corcoran on Ballinlovane and took the fish on Flying C at Cloonbeg. The fish would have been released, but was bleeding from the gills so had to be kept. The cast before he lost what they both believe was another springer, so there were definitely a few about. more rods out on the river each day. There are more fresh fish being seen in the river in the last few days. The river is in absolutely cracking order at the moment - even for the fly. 0.44m on the gauge so perfect fly height & clarity a good 4 feet. The weather forecast (Metcheck) looks dry for the next 2 weeks apart from about 6mm on the 15th. Bass fishing guide Michael McCormack from Wexford with the second fish of the season from the Lodge beats. It was sea-liced & weighed in at 10.2lb. It was taken on Silver Bullet on the Green Bank on Upper Kilmurry. Michael saw 3 or 4 more fresh fish as well during the day. He was the only rod out on the river today - one springer for one rod day cain't be bad! The third springer of the season was taken on Sunday, March 14 by Larry Sheridan (Dungarvan) who gillies for the Lodge. He released the fish which weighed about 12lb & was taken on black Flying C at the top of the Island Stream on Kents. It didn't have sea-lice but very fresh. He saw a couple more springers there as well. Unfortunately no picture as he doesn't carry a camera with him. 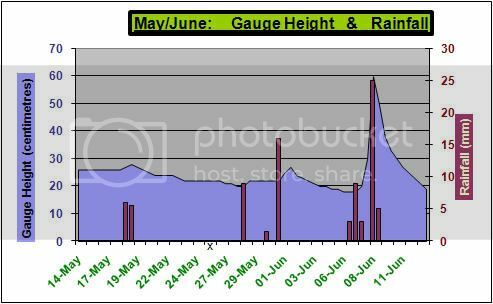 The river is now at summer level - 0.36m on the Ballyduff gauge. Perfect fly order. Lots of kelts being caught on flies as small as size 8. 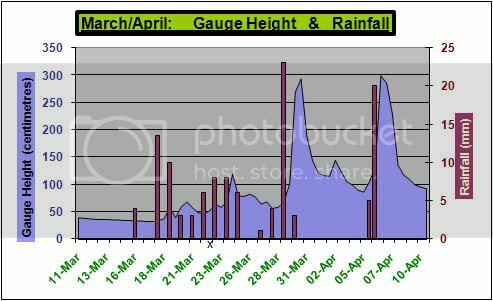 Here's the current water level on the Cork Blackwater at Ballyduff on April 10th. The river is falling slowly but steadily. The clarity has improved dramatically & is now about 5 feet on the lower river. It's still a bit too high to fish the fly comfortably. The 5th. springer of the season on the Lodge beats was caught on spinner on Beat 5 - Inchinleama last Sunday (April 4th.) before the last flood hit the river. One kelt was caught today - surprising that there are still some present in the river this late in the season. Fishing the Fly at Last! With such a beautiful balmy evening this evening, four of us decided venture out to the river about 6.00pm this evening. with the gauge height having dropped to 0.80m. Glenda & I headed for Lower, and the picture above is her at the Lug Pool at 7.15pm. She was able to wade & fly-fish the whole way down the pool even at this height. though could be fished from the (rather high) bank with a shooting head. and this picture was taken looking up the Island Stream to the Lug Pool on the bend in the distance. had briefly hooked one of them just after it showed. The clarity is about 5 feet & the level is falling steadily, so the prospects for the coming week look good. The First Springer on Fly is Caught! Denis O'Donnell from Cahir caught this lovely sea-liced 8.4lb fish on a ½ inch cone-head Cascade tube on the Island Stream on Lower Kilmurry today. He saw a fish running through the stream & caught this one 3 casts later, so there were definitely a few fish moving. 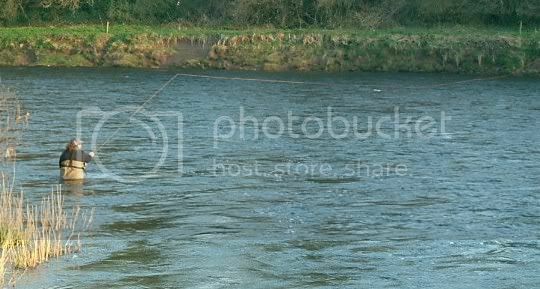 Kieran Conlon from Cork lost a similar fish at the net with Denis in the Island Stream after about 6/7 minutes - he could even see the sea-lice on its back, & lost another after about a minute on the Hut Pool on Upper Kilmurry. They saw at least half a dozen fish moving through. The lower river is rising slightly (a couple of inches) after yesterday's showers, but the clarity is still excellent. The upper river came up about 6 inches & peaked during the night & is already falling. The weather forecast is dry for the week, so fly-fishing prospects are excellent. There are rods available for the coming week. Edited by Ian Powell - Blackwater Lodge, 02 May 2010 - 08:27 PM. The Best Day so Far this season with two sea-liced fish caught for only 10 rods fishing. (only about 4 miles above the tide). Larry caught a 9.4lb. on #8 Ally's on a slow-sink tip & Michael a 6.4lb on FC. A number of running fish were seen & two met, one on fly & one on spun prawn. & a grilse up at Lombardstown in the last day or so. The run is definitely picking up, & with dry weather for the week, the fly-fishing prospects look excellent. The river was down to 0.38m today with clarity 5-6 feet. The river is at 0.34m this morning with clarity about 6 feet. Perfect fly-fishing conditions and it looks as if we're heading into a week of dry weather. Possibly some moderate rain next week then a further dry spell. so the prospects for the coming week are improving considerably. - needless to say there was no fish caught. running through - mostly fish of 7-8lb but including one which was well into double figures. this one almost immediately on the Island Stream. Met two more, but only half-hearted takes & didn't connect, then had to get home to pick the kids up from school! Would've loved to stay longer as I'm sure we would have met more fish. This, together with reports of good runs of grilse & salmon running from other beats on the lower river means the prospects in the coming days are looking good. Very little rain forecast for the coming week, certainly not enough to have any significant effect on the river. Flood moves fish from tidal water! This is the water level situation at Ballyduff in the last few days. The small flood on Tuesday put the river out of order for a couple of days as it became very coloured. By Friday it was improving and 3 fish were lost on the Lodge beats. Yesterday (Saturday), four fish were caught - 3 on spinner & one on fly. The best (~12lb) was caught & released by Ray Burns on Upper Kilmurry on spinner. Today, there were 3 grilse taken on the fly. Clarity is now a good 3 feet. Seven fish in total for 14 rod days in the last two days. There has been a significant increase in the number of fish moving through the lower beats since the flood. I'm also hearing about some grilse & salmon being caught up in the Mallow area. The Best Day of the Season mark set on Sunday lasted only two days. Yesterday, June 15th., it was beaten not withstanding the fact that there were only 3 rods fishing for the day. Six grilse were caught in total - all on the fly. In the late morning, Ray Burns caught one on Island Stream on Lower Kilmurry. caught from 2pm onwards on a fly he tied himself. only returning to the Lodge to report in at 10.00pm. . Four of the five fish were released. The river is down to 0.19 on the gauge & the clarity has improved to 4-5 feet since the last fresh we had last Tuesday. This has brought more fish into the lower beats, so the prospects for the week are looking better. The river level for June has probably been the lowest for about 50 years, which means that most fish are holding in the tidal reaches rather than running into the main river. The table below shows the average height for the month for the last four years – since the start of the drift net ban. This year it was 0.18m compared to the average for 2007-9 of 0.41m. In fact it was only above 0.30m (which we would normally regard as summer low level) for 2 days during the whole month. There have also been few rods out fishing for the month. We can see from the Table that – whilst the catch number for the month was not high at 24 – in fact the catch/rod day was 0.30, exactly the same as that for 2009 when there was far more water in the river. In fact, 22 of the fish were caught for only 24 rod days in the week from June 12 – an average of 0.9 fish per rod day, which was extremely good. One angler caught 5 in one afternoon – all on fly & 4 were released. Best fish of the month was a 12 pounder released on Upper Kilmurry. July has started off well after a small fresh in the river on the 2nd. Seven grilse have been caught for 6 rod days in the three days from July 2-4. Even although the river is very low, the clarity is good and runs of larger grilse (4-5lb.) are coming in. There is more rain forecast during the week, so the prospects of sport for the coming week are quite good. Very small flies, light worming & spun shrimp are working best, though fish are also being met on spinner. Glenda is fly-casting demonstrator at the Irish Game & Country Fair at Birr Castle in Co. Offaly on August 28 & 29th. We will also have a stand at the Fair. We have availability of rods & accommodation in the next couple of weeks. Late summer and backend weeks are now filling up fast, so contact us quickly if you are thinking of fishing later in the season.